Nicholas L. Eby – Page 2 – A place to share quick, informal, thoughts and updates on development projects. Search bar changing height is iOS11 revealed some skeletons in our closet, primarily around trying to maintain opaque navigation and tab bars which led to layout issues. I also explored moving the search bar to the new searchController property on navigation controller, but the business ultimately wanted to maintain the title view approach/look. Search controller is nice though because it has support for large title, hiding when scrolling, etc. Supporting iPhone X wasn’t too much effort because of my previous enforcement of using native views/controls and auto layout. 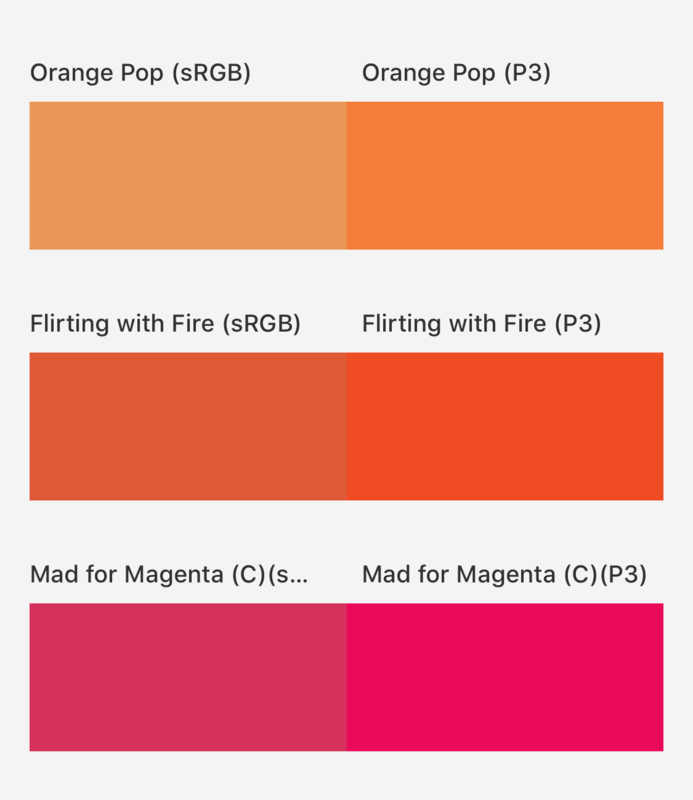 For P3 colors we changed obvious things at first: launch screen, app icon and primary brand colors. We also made a conscious choice to not make every brand color P3, like the typography saying “If everything is bold, nothing is bold” – and we wanted certain color to stand out. P3 conversion from a code perspective is simple, but from a conversion standpoint I still am not sure the proper method. As with Cart, my team and I re-wrote checkout from the ground up. We set out to create a user-friendly, ada compliant, and reliable single-page checkout. In the summer of 2017 we had just wrapped up a huge 5.0 release, which featured our brand new homepage redesign. With the momentum from that release we set out on an even larger challenge; to rebuild our cart & checkout experience from the ground up (or in this case from the backend services to the frontend UI). We knew this was no easy feat, like the homepage, cart & checkout is an intricate part in the customer journey, and the core of our commerce business. Global messaging (bag updates: removed, updated, etc) and Item level in-line messaging. Enriched product cells with promotional and discount information. 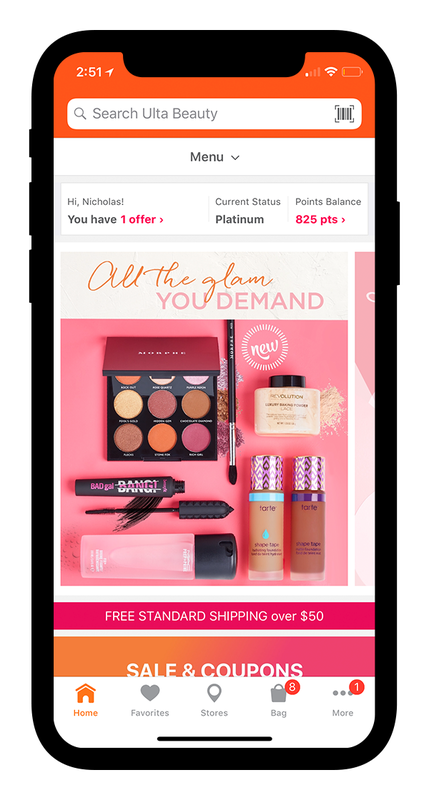 Check out quickly with Apple Pay or PayPal. Free gifts section with simple options to select variants. When it was finally time to retire the existing homepage, we made sure to set the foundation for a rich future. To prepare for this future we set out on building a modular framework that could be customized and controlled completely by our business team members. 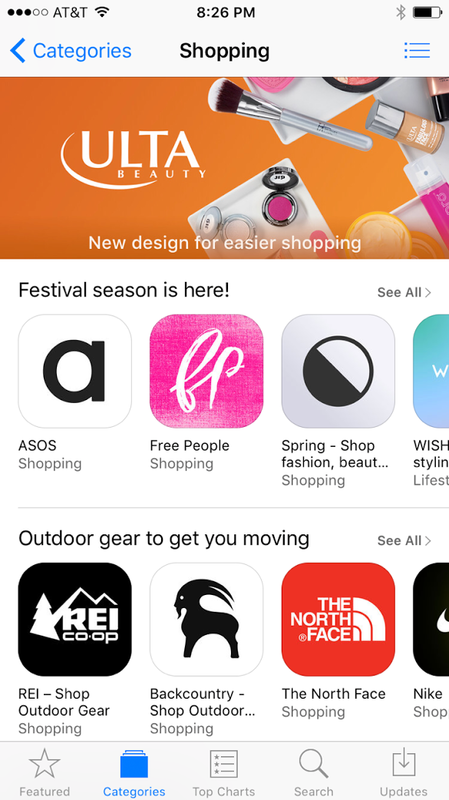 Featured in the App Store for redesign! 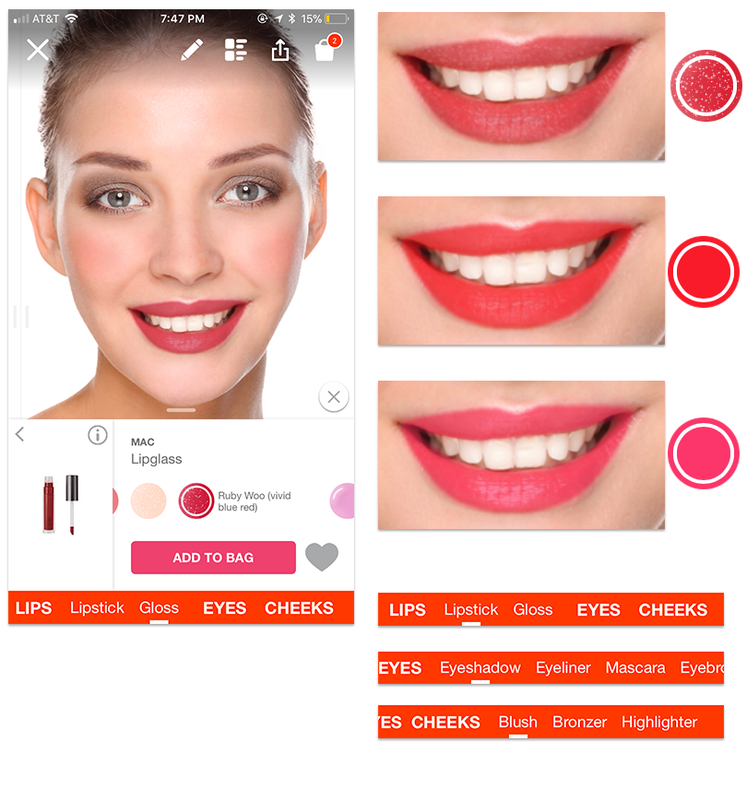 We know how important it is for our guests to find that perfect shade of lipstick, so that’s why we made our product detail page better than ever. 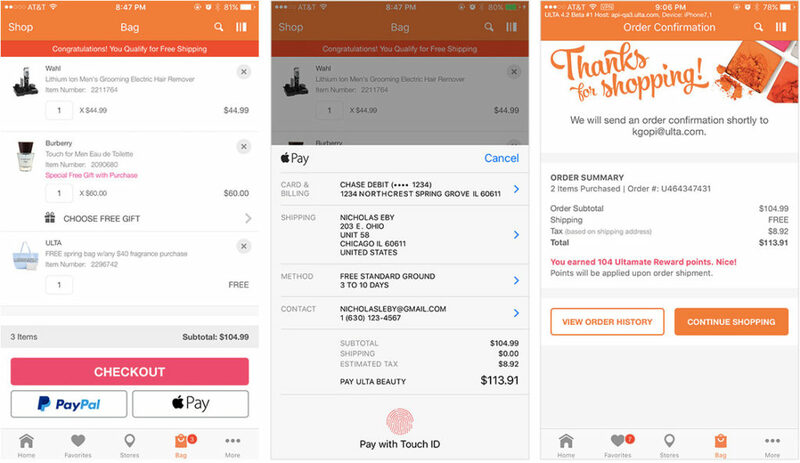 Integrating Apple Pay took a ton of work from multiple teams across Ulta Beauty. Being new to the company I had to rely on my co-worker’s deep knowledge of our checkout experience to get me on-boarded, and together we worked closely to come up with a solution that satisfied our customers’ needs. 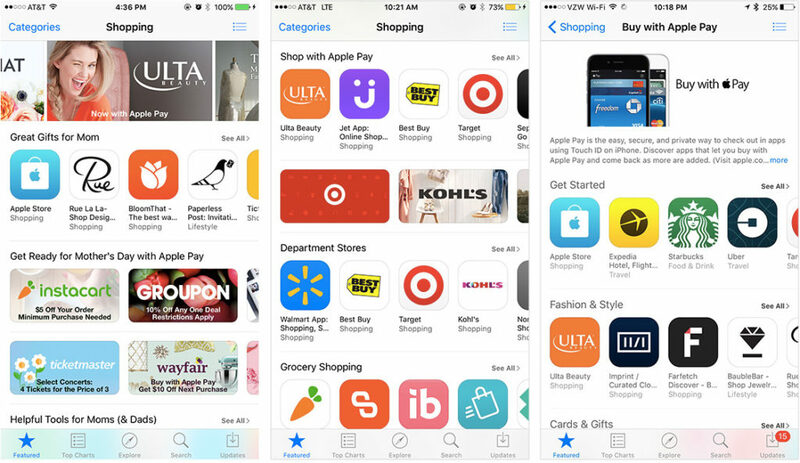 Our Director of Mobility, Joe Rago, has said on a few occasions that “Nothing will help you find the skeletons in your checkout flow closet like implementing Apple Pay.” This statement couldn’t be more true. We had to rework many steps in our checkout flow to make sure the Apple Pay experience was seamless from start to finish. 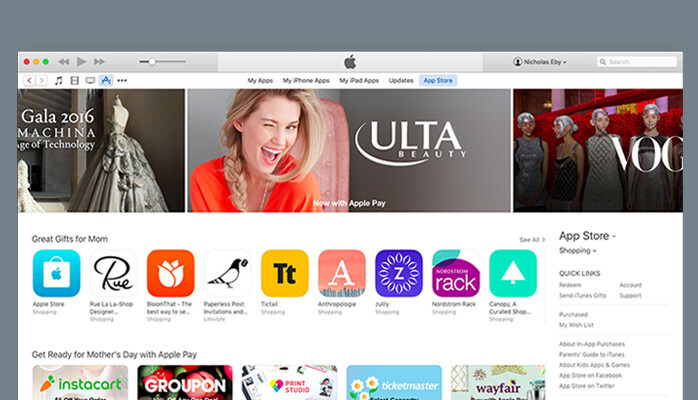 Nothing will help you find the skeletons in your checkout flow closet like implementing Apple Pay. After many hours of development, design, countless QA testing, and user-experience work we were ready for our first orders! My first production order was for 2B Colours Mega Colours Mini Nail Polish, which I sadly returned to the store. more testing! 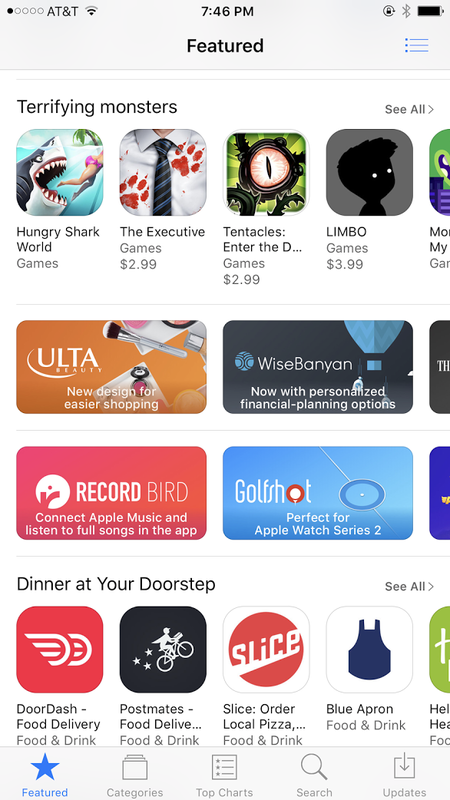 Since launching the app update, we have been featured in the App Store multiple times, including the coveted App Store front page spot, and a promotional spot in the Shopping category carousel. A huge accompaniment for the team. So I want to again thank the team for all the hard work on this first release, everyone involved stepped up to the plate and delivered. The hard work isn’t over, we are continually improving the experience for our customers, and are excited for future releases. If you haven’t tried it yet, go ahead and download the app today from the App Store. 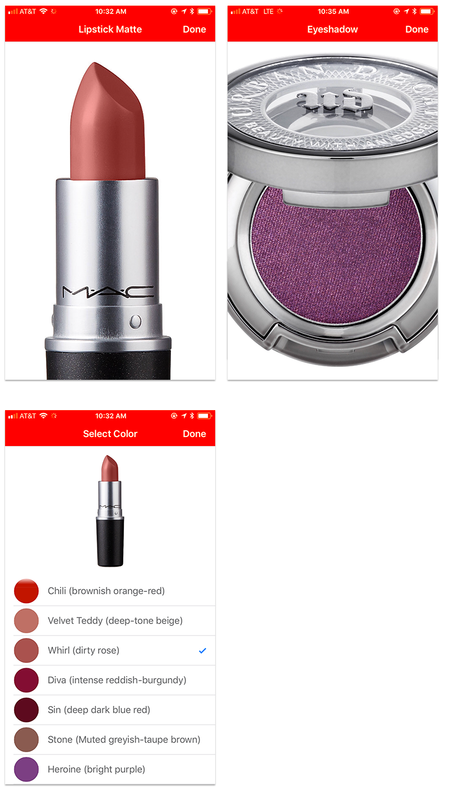 You can now find all things beauty, all in one place & check out in a snap with Apple Pay in the new iPhone app from Ulta Beauty.